The Sacramento Tribe recently won the San Diego Memorial Day Fun Tournament 60-over American division championship. That comes as no surprise to anyone who knows of this team’s rich pedigree. Danny Pawelek threw the championship game victory, which is equally of no surprise to anyone who knows about this hired gun with the elastic arm. The real story is how he got to that moment in the tournament, which included a no-hitter in the semi-finals. Let me explain, with a little help from Danny. Danny not only got back on the mound but amazingly threw a no-hitter! If that wasn’t enough, he stayed wrapped up and threw an 11-2 championship victory. Two victories in one day while nursing a pulled hamstring. Just like fine wine this Utah native gets better with age. Danny has been pitching for about 18 years and has amassed somewhere in the vicinity of 320 victories. 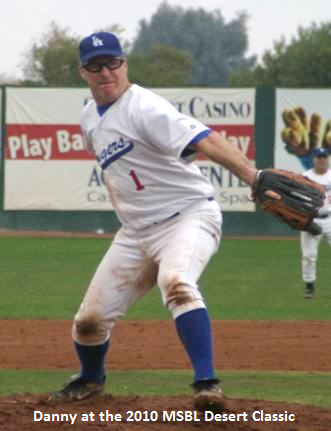 You can’t help but see him smiling and chucking in the MSBL World Series in Arizona for three weeks as well as in Las Vegas and Palm Springs, not to mention regional tournaments like the recent San Diego tourney.